The generally accepted theory is that people with autism lack a "theory of mind". They fail to grasp that other people have minds that motivate them to act. This does not refer to a profound grasp of the motivations of others, but to a very basic appreciation of the nature of the other people in the world. A classic test for autism, which graphically demonstrates this deficit, is known as the "Sally Ann Test". The child is shown two dolls. Sally has a basket, where she places a marble and Ann has an empty box. Sally leaves the room, and then Ann picks up the marble and places it in her box. Both box and basket are covered. The child is asked where Sally will look for her marble when she comes back. Normal children, and even children with other mental handicaps, like Down's syndrome, will usually get it right, understanding that Sally will look in the basket, where she left the marble. Autistic children tend to say that she'll look in the box. They fail to understand that although they saw Ann put the marble in the box, Sally, who was out of the room, did not see this, and her thinking will only be affected by what she saw, not by what the observing child saw. Most of us, for whom theory of mind is an innate capacity, cannot begin to imagine what a confusing and disjointed place the world of human interaction must be for an autistic child. Uta Frith, an eminent psychologist, author and expert on autism, claims that this lack of theory of mind is part of a general lack of drive towards central coherence. Autistic people are unable to, or are unmotivated to put different pieces of information together to make a coherent whole. This affects both social skills and other areas. Since they fail to distinguish speech sounds from random background noise or deduce grammatical rules from the sentences they hear, their language development is slow. Frith suggests that, since other mental handicaps are so common, autism may be just one of the problems in a brain that has suffered some sort of damage or injury during development. 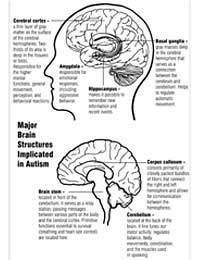 Neurological explanations that have been suggested to attempt to pinpoint how an autistic brain functions have included a disorder of the white matter, poor integration between left and right hemispheres, and damage to the frontal lobe. The most controversial theory, by Simon Baron Cohen, a Cambridge University psychologist specialising in autistic disorders, claims that autism represents an extreme form of the male intellect and mind-set, with an affinity for systems rather than human relationships. Indeed, the figures show that autism is about four times commoner in boys than girls. Some fascinating research has been done using special spectacles that detect where gaze is focused while an individual watches television. Non autistic people tend to focus their gaze most of the time on the faces of the actors while watching, whereas autistic children and adults show no particular preference for faces. This fits well with results of many studies involving brain scans done while showing pictures of various faces. The scans show enhanced activity in a small patch of the brain by the right ear that is called it the fusiform face area, when non autistic subjects are shown faces. Such activity is lacking when the pictures are of objects like trees, houses, cars, or even of other body parts. In autistic subjects, there is no enhanced activity in the fusiform face area while looking at faces. Similarly, autistic individuals may have difficulty in recognising their own faces or those of family members in photographs or home videos taken when they were younger. An intriguing question is whether an autistic brain is incapable of facial recognition, or whether anxiety at the prospect of a social interaction may stifle an autistic person's ability to engage in it. Whatever the answer to this, it is clear that faces are the quintessential social stimulus. Our ability to respond to them appropriately is probably fundamental for the theory of mind that is lacking in autism.